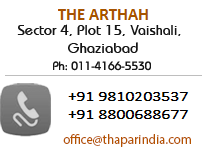 THAPAR BUILDERS (P) LTD. established in the year, 1983. has become a name to be reckoned with as one of the leading developers dealing in both, residential & commercial buildings, spanning from Delhi, U.P. and Haryana to Mumbai, dealing in construction to an integration of real estate development, property analysis and investment, building development and management and hospitality.Today, we are part of “House of Thapar.” We believe that professionalism and innovation are the stepping- stones for success. Ashok Thapar started at the age of 16 from the small town of Meerut. In the early 1970s, he successfully launched a non banking financial services company. Post the amendment in banking laws; he began his career in real estate development. He single- handily built a real estate empire. He is a focused individual with sharp business acumen. A real estate visionary, with over 50 years of experience, Ashok has developed an instinct to buy land with great appreciation potential. He has developed real estate project all over NCR & Mumbai. Ashok is a strong believer in quality over quantity of projects. Gautam joined his family business in 2008. Prior to that, he obtained a degree in Business Sciences with majors in Entrepreneurship and Economics with a minor in Finance from Babson College, Boston. He was brought up in New Delhi and completed his high school education at St. Columbas. Gautam is ambitious and carries a vision to develop high- class of properties around the National Capital Region (NCR) and make his family business soar to new heights. The younger of the Thapar sons, Arjun, attended college in Switzerland at “Les Roches.” He studied hotel management. He completed high school at St. Columbus School in New Delhi. Arjun shares the vision for “THAPAR BUILDERS” to become one of the top firms in India. But, he goes beyond the field of real estate, into the field of hospitality. He has been instrumental in starting the hospitality chain of the group under the “Te” banner. He aims to grow in the hospitality industry by opening boutique business hotels all over India. The group strategy is to achieve this through self- owned properties and collaboration with others for management contracts. The two brothers themselves have defined their respective roles in real estate and hospitality. They work in unison to make “THAPAR BUILDERS” a leading real estate company in the commercial and residential space in India. Professionalism and innovation are the stepping- stones for success.